-What does Jesus mean when he says he came to give us "abundant life" (John 10:10)? -What does it mean that we are to "judge not" (Matthew 7:1)? -Does God really have a unique plan and purpose for every one of us (Jeremiah 29:11)? -Is Jesus standing at the door of our hearts, knocking and pleading to come in (Revelation 3:20)? 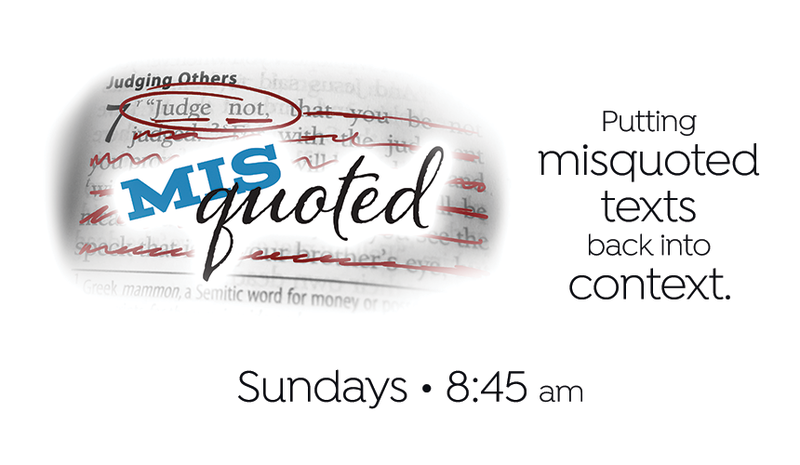 Join us for our "Misquoted" Sunday morning Bible study at 8:45 am, as we look at various popular Bible verses that have been misunderstood as they are often quoted out of context. We will put them back into context and discover what God would truly have us know from these parts of His sacred Word.